A worker is seen at the Olympic Stadium, venue for the opening and closing ceremonies of the 2018 Pyeongchang Winter Olympic Games in Pyeongchang, South Korea, Dec. 12, 2017. North and South Korea will hold high-level talks on Tuesday primarily to discuss the North’s participation in the upcoming winter Olympics, but also to look for ways to reduce heightened tensions over Pyongyang’s growing nuclear threat. 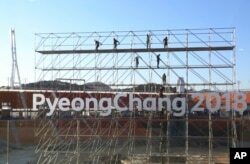 South Korea will host the 2018 PyeongChang Olympic games from February 9 to 25, as well as the Paralympics Winter Games from March 9 to 18. South Korean President Moon-Jae-in has stressed the theme of peace and reconciliation for the Olympics, and repeatedly invited North Korea to participate, as a way to restart inter-Korean dialogue that was suspended after a 2016 North Korean nuclear test. "There are things that we suggested to North Korea for the peace Olympics. We are preparing to focus on such things, and we are predicting that mutual interests will work to improve inter-Korean relations," said Unification Ministry spokesman Baik Tae-hyun on Monday. The inter-Korean talks will be conducted on the southern side of the demilitarized zone (DMZ) that separates the divided peninsula at the truce village of Panmunjeom, where the 1953 armistice agreement to end the Korean War was signed. North Korea's IOC member Chang Ung, middle row left, waves with officials of International Taekwondo Federation upon their arrival at Gimpo International Airport in Seoul, South Korea, June 23, 2017. Leading the delegations will be South Koran Unification Minister Cho Myung-gyon and his North Korean counterpart Ri Son Gwon, the chairman for the Committee for the Peaceful Reunification of the Country of the Democratic People’s Republic of Korea (DPRK.) Respective representatives from sports ministries and Olympic organizing committees will also participate. Moon had in the past proposed that Olympic athletes from the two Koreas march together in the opening ceremony, as they had done in both the 2000 summer Olympic games in Sydney and the 2004 Athens Olympics. While Pyongyang has missed the deadline to participate in the 2018 games, the International Olympic Committee could still offer an invitation to a North Korean delegation. Since taking office in May of 2017, President Moon has also advocated for increased outreach to North Korea, while at the same time supporting international sanctions on the Kim Jong Un government for its continued development of nuclear and ballistic missiles. Pyongyang had rejected past offers of humanitarian aid and requests to organize reunions for families separated by the longstanding division of the Korean Peninsula. But in his New Year’s Day speech, Kim Jong Un agreed to discuss sending a delegation to the 2018 PyeongChang Olympics, and said that "North and South must work together to alleviate the tensions" between the two countries. The decision by the United States and South Korea to postpone joint military exercises until after the Olympics are over, helped pave the way for renewed inter-Korean dialogue. Pyongyang objects to these joint drills as "rehearsals for invasion" of North Korea. If North Korea participates in the Olympics, it will likely refrain from any missile nuclear tests during the duration of the games. 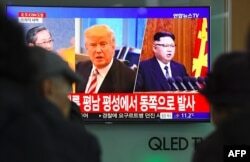 U.S. President Donald Trump said during a Sunday news conference that he hopes the newly arranged talks between North and South Korea will go "beyond the Olympics" and promised the United States will take part "at the appropriate time." The Trump administration however remains skeptical that any Olympics-related cooperation will lead to a significant diplomatic breakthrough in which Kim Jong Un would agree to give up his country’s nuclear weapons in return for economy aid and security guarantees. "Ever the optimist, always the realist, I hope that is the case, but past history would indicate that is a feint, this is not likely to lead to any true change in his strategic outlook," said Mike Pompeo, director of the Central Intelligence Agency, during an interview on the CBS News program Face the Nation. Over the New Year, Trump and Kim exchanged provocative taunts, with the North Korean leader boasting he now has a "nuclear button'' on his office desk, and the U.S. president tweeting that his nuclear button is "much bigger and more powerful." On Sunday, Nikki Haley, the U.S. ambassador to the United Nations said President Trump's nuclear button tweet was meant to keep Kim "on his toes" by warning that the U.S. has superior nuclear capabilities and would respond to an attack with overwhelming force.